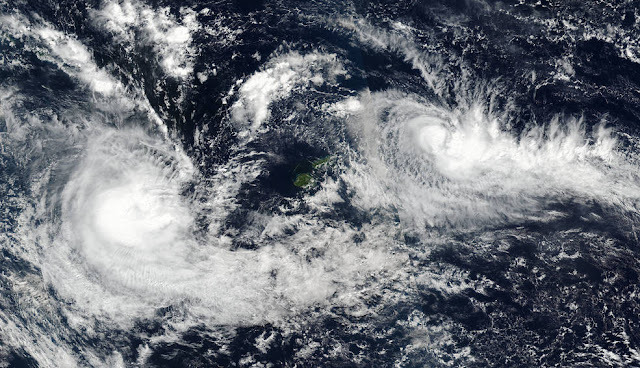 NASA Sees Tropical Cyclone Donna and Ella "Bookend" Fiji The island of Fiji appears to be "bookended" by tropical cyclones in imagery from the NASA-NOAA Suomi NPP satellite. Tropical Cyclone Donna is west of Fiji and newly developed Tropical Cyclone Ella has developed east of the island. AccuWeather reports; Donna has weakened to a Category 3 severe tropical cyclone, or the equivalent of a Category 1 hurricane in the Atlantic and eastern Pacific basins, but threats continue across New Caledonia. Torrential rain and destructive winds will impact New Caledonia with the Loyalty Islands at greatest risk as the cyclone passes through the area on Wednesday. Massive seas in excess of 8 meters (26 feet) have built over the eastern Coral Sea around Donna, posing extreme dangers to those with shipping interests.